If you should choose to eat inside. Many resorts are on the ocean, but fewer units are ocean FRONT, meaning that there's nothing between your home and the ocean but a few steps across the lawn. Check out our pictures and we promise it will be even better once you arrive. 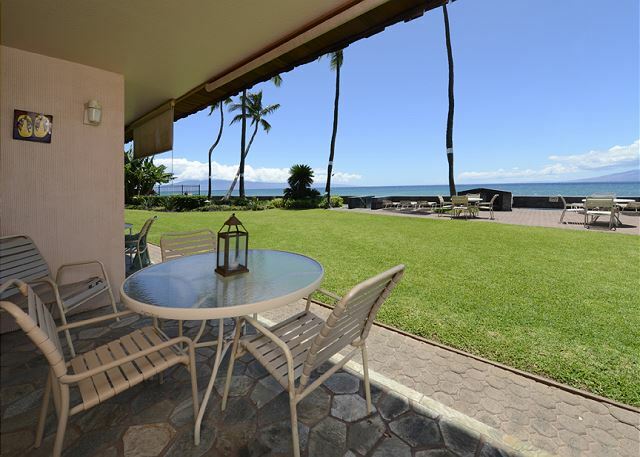 The first floor means you walk directly out to the pool area and Maui's warm waters. The condo features a granite and tile full bath, maple finish kitchen cabinets, polished slate floors, island-style contemporary decor, ceiling fans, quality furniture and appliances and free Wi-Fi and parking. We are a smoke-free complex. The kitchen is fully equipped with a refrigerator, 4 burner stove and oven, ice maker dishwasher, microwave, toaster, blender and coffee maker, along with all the dishes, glassware, silverware and cookware you will need. There is plenty of cabinet space to stash away your groceries. Enjoy your meals at our glass-topped kitchen dining spot for two, or outside on your lanai. The living area has a 32" flat screen TV, DVD player, CD player, iPod/iPhone docking station and cable TV. 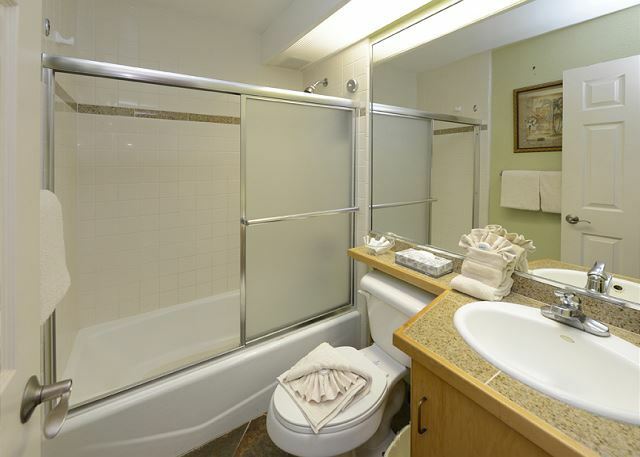 The full bath includes a tub, shower, sink, medicine cabinet and granite counters. The bedroom features a king bed, mirrored sliding door closets and a dresser with plenty of storage space. Leave the louvered windows open to keep the breezes flowing and the smell of the plumeria tree. It;s the best thing ever! The condo sleeps four, as it has a queen sleeper sofa. Perfect for a couple or a small family. On property, there is a coin operated laundry for your use, along with 2 large BBQ grills. Hopefully there will be some fresh herbs for you to use while you're here. For your day trips around the island, we have a rolling cooler, another small cooler, a beach umbrella, sand toys and four beach chairs. Our location is in Honokowai, 10 minutes north of Lahaina and 10 minutes south of Kapalua. With all due respect to the Wailea/Kihei fans out there, we think West Maui is the best for beaches and restaurants. You don't have to do as much driving to get to places; there is more to do, see, and eat, within a 10 minute drive in either direction. Walk 5 minutes south to the Farmer's Market 3 days a week, and sample some fresh banana bread...it's one of our favorite things to do. If you're here on a Friday night, join the other Kulakane guests, pooside at sunset for the weekly pupu (appetizer) party hosted by our on-site rental manager, the fantastic Debbie. Bring your favorite dish to share and blow the conch shell at sunset with your fellow guests. It's a fun Hawaiian style tradition that is just one of the things that makes our place so special. We've stayed in Maui for many years, and been at many of the big resorts, but there is nothing like having your own private home that is just steps from the water - no resort fees, hiking through miles of hallways and legions of people everywhere. No thanks! We'll take west Maui's quiet, small town atmosphere any day. Come once and we know you'll come back again. We looked at dozens of places before choosing this condo and we are so proud to offer it to you. I would definitely stay here again, no hesitation at all. Friendly people, Debbie and Tony were great and attentive to any questions/needs I had. Who wouldn't love looking out at the ocean every day and watching the sunset every night right out your front door?You can walk to the beach and lots of stores and restaurants nearby. Pupu party every Friday! Very disappointed in this unit. The bed was so bad that you could not sleep in it without a terrible backache. You could even see just by looking at the bed that it was very old. The toilet was leaking from the bottom onto the floor. I think the owners must not come and stay or they would take better care of there unit. BUT Thanks to manager Debbie, I went and spoke with her the next morning and she moved us into a beautiful unit #101, I would rent this unit again. Very private and also had a private patio. Every unit has a wonderful view. The people who live there part of the year are so friendly and made us feel at home. Ive been to Maui over 30 times and is my favorite place to rest, play and relax. I hope that the owners of unit 106 can make some needed changes especially a good bed. A bed is so important. I would stay again at Kulakane but not unit 106 unless changes were made. Great time at the Kulakane condo 106. Very nice location in a very nice sunset POV. Great baseon operations for the west coast of Maui. Unit had everything we needed with great views of whales and turtles out front. We arrived late and had no trouble getting our key, everyone was nice and we had a blast. Appreciate some of the sand toys, boogie boards, umbrellas on hand (was not expecting these amenities). Walk to coffee and maca chocolates to boot, thanks for a great stay! Thoughtfully-appointed unit, clean, with cute tropical decor. Pretty ocean view from the seawall (the lawn was all torn up from a recent storm). Everyone was nice. But there is really nothing on the property to do or see, so I always left quickly to find a beach to enjoy or something of interest. Pool was tiny and went unused. Would have spent a little more money had I known. Over hyped, over priced for what it is! Mark B from Prudenville, MI does not recommend this vacation rental. No one said in advance that the office would not be open when we arrived. We were going to find a place to sleep the first night when a woman in the parking lot ask us what was wrong and explained about the envelope taped to the door. The unit had cob webs in every corner of each room. The window latches that hold the flipper windows open were broken and we propped windows open with salt shakers. Only one dim light in the bedroom and some light switches don't work. Old silver wear with some rust spots. Our view out the big window was the orange construction barrier. We never experienced anyone from property management as the office was closed again when we left. There was an outdoor maintenance guy named Tony who was very helpful when asked any questions. 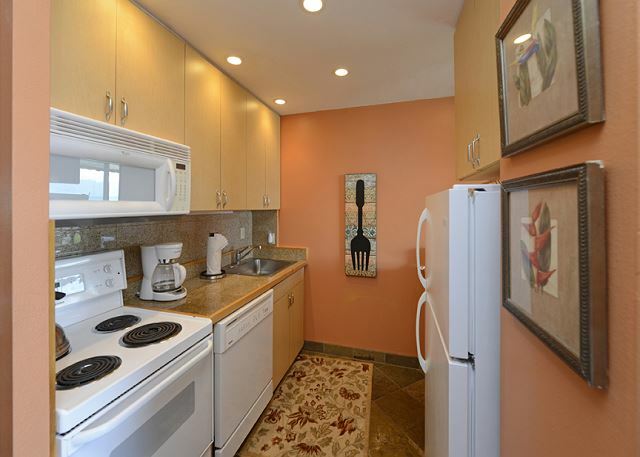 The kitchen is well equipped, so convenient to cook in condo as there are many grocery stores and farmer markets nearby. Eventing is so relaxed here and that's exactly what I am looking for. Thanks!!! We had a wonderful time! We would return in a heartbeat! Debbie was able to get us into our unit a bit early which worked out great for us. Very neat and clean. Would go back again. We stayed there one night before heading to big resort. We enjoyed this so much due to the location and relaxing quiet atmosphere. Great trip. Loved the property. It was exactly as advertised. We would stay here again! My only recommendation was to update the wifi as I had to borrow the neighbors. THE RENTAL FACILITY IS WONDERFUL. Debbie is very nice and helpful. I did not like slate floor. Can't wait to come back again. GREAT LOCATION for our vacation. Right on the water - wonderful to fall asleep to the sound of the ocean. Snorkeling right there - saw many sea turtles. Walking distance to a marvelous farmers market and park. Short drive to Lahaina and Kaanapali. A great vacation spot with wonderful sunsets and without the crowds. Our family had a great family vacation and this condo and its location helped make that possible. Walking distance to so many great things - farmers market, parks and other beaches. Saw sea turtles and whales breaching from the patio. We had a really nice time in Maui! The Kulakane was an easy place for us to stay! We were able to snorkel right off the water here and we saw Sea Turtles! It was a wonderful experience to watch them! Fantastic. You can't get much closer to the ocean, beautiful sunsets and magnificent rainbows. Mike & Mary C from Seahurst, WA does not recommend this vacation rental.